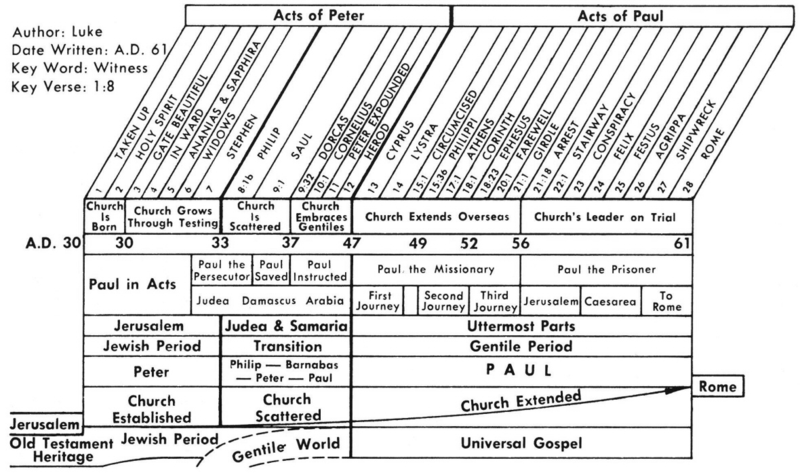 Considering the fact that Acts 13 is such a strategic chapter in regard to world evangelism, take a moment and study Irving Jensen's chart at top of the page (click it to enlarge it which is what I have to do at age 72!). Notice the bold vertical line (|) at the end of Acts 12 and beginning of Acts 13 which Jensen estimates to be about year 47 (it could be a short time prior). 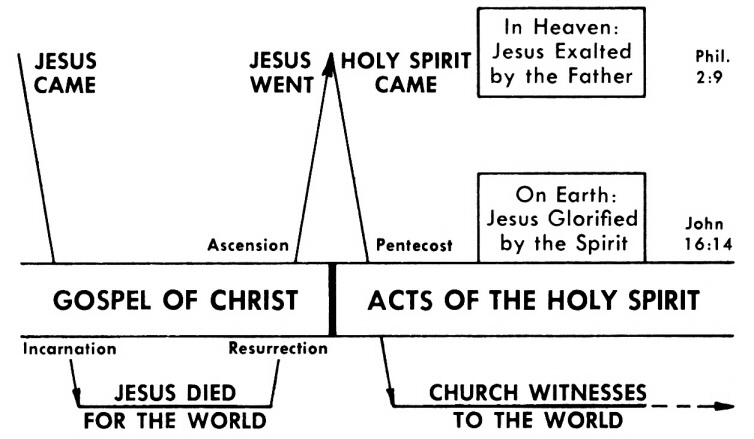 Note the horizontal description of "Church" - Church Established in the first 13 years from Acts 1 through Acts 7, then the Church Scattered between Acts 8 through Acts 12, which occurred over a period of about 14 years (and remember all dates and times are at best approximations because Luke gives only a few events that allow us to give specific dates, such as the death of Herod in A D 44 in Acts 12:23) and lastly, beginning in Acts 13 (and until the end of this age), the Church Extended, this extension being the primarily the fruit of Paul's Three Missionary Journeys which"upset the world!" (Acts 17:6) Now, you have a good grasp of the chronological context of Acts 13. And as they say in the restaurant when your delicious meal is served "Enjoy!" The three missionary journeys are summarized below (this note will be repeated in subsequent chapters). Click links for the maps of each journey. Maps in table above are from the Holman Bible Atlas (digital book; Hardcover/Paperback version) copyrighted © 1998 B&H Publishing Group, used by permission, all rights reserved. This is one of the best resources for Bible maps as the maps also include helpful short descriptions of the events portrayed on the maps. Please do not download for use on another website. Thank you. Here is a map with all three journeys on one map. Acts 19:1 It happened that while Apollos was at Corinth, Paul passed through the upper country and came to Ephesus, and found some disciples. This is one of the best resources for Bible maps. Please do not reproduce this map on any other webpage. This journey began in Acts 18:23 and will extend through Acts 21:26. A T Robertson - While Apollos was at Corinth . Favourite idiom with Luke, ἐν [en] with the locative of the articular infinitive and the accusative of general reference (Luke 1:8; 2:27, etc.). A T Robertson - The word for “upper” (anōterika) is a late form for ἀνωτερα [anōtera] (Luke 14:10) and occurs in Hippocrates and Galen. It refers to the highlands (cf. Xenophon’s Anabasis) and means that Paul did not travel the usual Roman road west by Colossae and Laodicea in the Lycus Valley, cities that he did not visit (Col. 2:1). Instead he took the more direct road through the Cayster Valley to Ephesus. Codex Bezae says here that Paul wanted to go back to Jerusalem, but that the Holy Spirit bade him to go into Asia where he had been forbidden to go in the second tour (16:6). Whether the upper “parts” (merē]) here points to North Galatia is still a point of dispute among scholars. A T Robertson - So he came again to Ephesus as he had promised to do (Acts 18:21). The province of Asia included the western part of Asia Minor. The Romans took this country B.C. 130. Finally the name was extended to the whole continent. It was a jewel in the Roman empire along with Africa and was a senatorial province. It was full of great cities like Ephesus, Smyrna, Pergamum, Thyatira, Sardis, Philadelphia, Laodicea (the seven churches of Rev. 2 and Rev 3), Colossae, Hierapolis, Apamea, to go no further. Hellenism had full sway here. Ephesus was the capital and chief city and was a richer and larger city than Corinth. It was located at the entrance to the valley of the Maeander to the east. Here was the power of Rome and the splendour of Greek culture and the full tide of oriental superstition and magic. The Temple of Artemis (picture) was one of the seven wonders of the world. While in Ephesus some hold that Paul at this time wrote the Epistle to the Galatians after his recent visit there, some that he did it before his recent visit to Jerusalem. But it is still possible that he wrote it from Corinth just before writing to Rome, a point to discuss later. A T Robertson - Some disciples (tinas mathētas). Who were they? Apollos had already gone to Corinth. They show no connection with Priscilla and Aquila. Luke calls them “disciples” or “learners” (mathētas) because they were evidently sincere though crude and ignorant. There is no reason at all for connecting these uninformed disciples of the Baptist with Apollos. They were floating followers of the Baptist who drifted into Ephesus and whom Paul found. Some of John’s disciples clung to him till his death (John 3:22–25; Luke 7:19; Matt. 14:12). Some of them left Palestine without the further knowledge of Jesus that came after his death and some did not even know that, as turned out to be the case with the group in Ephesus. Acts 19:2 He said to them, "Did you receive the Holy Spirit when you believed?" And they said to him, "No, we have not even heard whether there is a Holy Spirit." KJV Acts 19:2 He said unto them, Have ye received the Holy Ghost since ye believed? And they said unto him, We have not so much as heard whether there be any Holy Ghost. He said to them, "Did you receive the Holy Spirit when you believed?" And they said to him, "No, we have not even heard whether there is a Holy Spirit." Acts 19:3 And he said, "Into what then were you baptized?" And they said, "Into John's baptism." KJV Acts 19:3 And he said unto them, Unto what then were ye baptized? And they said, Unto John's baptism. And he said, "Into what then were you baptized?" And they said, "Into John's baptism." Acts 19:4 Paul said, "John baptized with the baptism of repentance, telling the people to believe in Him who was coming after him, that is, in Jesus." KJV Acts 19:4 Then said Paul, John verily baptized with the baptism of repentance, saying unto the people, that they should believe on him which should come after him, that is, on Christ Jesus. aul said, "John baptized with the baptism of repentance, telling the people to believe in Him who was coming after him, that is, in Jesus." KJV Acts 19:5 When they heard this, they were baptized in the name of the Lord Jesus. KJV Acts 19:6 And when Paul had laid his hands upon them, the Holy Ghost came on them; and they spake with tongues, and prophesied. KJV Acts 19:8 And he went into the synagogue, and spake boldly for the space of three months, disputing and persuading the things concerning the kingdom of God. KJV Acts 19:9 But when divers were hardened, and believed not, but spake evil of that way before the multitude, he departed from them, and separated the disciples, disputing daily in the school of one Tyrannus. KJV Acts 19:10 And this continued by the space of two years; so that all they which dwelt in Asia heard the word of the Lord Jesus, both Jews and Greeks. KJV Acts 19:12 So that from his body were brought unto the sick handkerchiefs or aprons, and the diseases departed from them, and the evil spirits went out of them. Acts 19:13 But also some of the Jewish exorcists, who went from place to place, attempted to name over those who had the evil spirits the name of the Lord Jesus, saying, "I adjure you by Jesus whom Paul preaches. KJV Acts 19:13 Then certain of the vagabond Jews, exorcists, took upon them to call over them which had evil spirits the name of the Lord Jesus, saying, We adjure you by Jesus whom Paul preacheth. Acts 19:15 And the evil spirit answered and said to them, "I recognize Jesus, and I know about Paul, but who are you? KJV Acts 19:15 And the evil spirit answered and said, Jesus I know, and Paul I know; but who are ye? KJV Acts 19:16 And the man in whom the evil spirit was leaped on them, and overcame them, and prevailed against them, so that they fled out of that house naked and wounded. KJV Acts 19:17 And this was known to all the Jews and Greeks also dwelling at Ephesus; and fear fell on them all, and the name of the Lord Jesus was magnified. KJV Acts 19:18 And many that believed came, and confessed, and shewed their deeds. KJV Acts 19:19 Many of them also which used curious arts brought their books together, and burned them before all men: and they counted the price of them, and found it fifty thousand pieces of silver. fifty Probably Attic drachms; which at 7.®d. each, would amount to 1,562£. 10s. or at, 9d. each, to 1,875£. Acts 19:20 So the word of the Lord was growing mightily and prevailing. KJV Acts 19:20 So mightily grew the word of God and prevailed. Acts 19:21 Now after these things were finished, Paul purposed in the spirit to go to Jerusalem after he had passed through Macedonia and Achaia, saying, "After I have been there, I must also see Rome." KJV Acts 19:21 After these things were ended, Paul purposed in the spirit, when he had passed through Macedonia and Achaia, to go to Jerusalem, saying, After I have been there, I must also see Rome. Acts 19:22 And having sent into Macedonia two of those who ministered to him, Timothy and Erastus, he himself stayed in Asia for a while. KJV Acts 19:22 So he sent into Macedonia two of them that ministered unto him, Timotheus and Erastus; but he himself stayed in Asia for a season. Acts 19:23 About that time there occurred no small disturbance concerning the Way. KJV Acts 19:23 And the same time there arose no small stir about that way. [Naus] temples, probably portable silver models of the temple of Diana, and small images of the goddess, somewhat like the Santa Casa purchased by pilgrims at Loretto. Acts 19:25 these he gathered together with the workmen of similar trades, and said, "Men, you know that our prosperity depends upon this business. KJV Acts 19:25 Whom he called together with the workmen of like occupation, and said, Sirs, ye know that by this craft we have our wealth. Acts 19:26 "You see and hear that not only in Ephesus, but in almost all of Asia, this Paul has persuaded and turned away a considerable number of people, saying that gods made with hands are no gods at all. Acts 19:27 "Not only is there danger that this trade of ours fall into disrepute, but also that the temple of the great goddess Artemis be regarded as worthless and that she whom all of Asia and the world worship will even be dethroned from her magnificence." KJV Acts 19:27 So that not only this our craft is in danger to be set at nought; but also that the temple of the great goddess Diana should be despised, and her magnificence should be destroyed, whom all Asia and the world worshippeth. Acts 19:28 And when they heard this and were filled with rage, they began crying out, saying, "Great is Artemis of the Ephesians!" KJV Acts 19:28 And when they heard these sayings, they were full of wrath, and cried out, saying, Great is Diana of the Ephesians. Acts 19:29 The city was filled with the confusion, and they rushed with one accord into the theater, dragging along Gaius and Aristarchus, Paul's traveling companions from Macedonia. KJV Acts 19:29 And the whole city was filled with confusion: and having caught Gaius and Aristarchus, men of Macedonia, Paul's companions in travel, they rushed with one accord into the theatre. Acts 19:30 And when Paul wanted to go into the assembly, the disciples would not let him. KJV Acts 19:30 And when Paul would have entered in unto the people, the disciples suffered him not. Acts 19:31 Also some of the Asiarchs who were friends of his sent to him and repeatedly urged him not to venture into the theater. KJV Acts 19:31 And certain of the chief of Asia, which were his friends, sent unto him, desiring him that he would not adventure himself into the theatre. Acts 19:32 So then, some were shouting one thing and some another, for the assembly was in confusion and the majority did not know for what reason they had come together. KJV Acts 19:32 Some therefore cried one thing, and some another: for the assembly was confused; and the more part knew not wherefore they were come together. Acts 19:33 Some of the crowd concluded it was Alexander, since the Jews had put him forward; and having motioned with his hand, Alexander was intending to make a defense to the assembly. KJV Acts 19:33 And they drew Alexander out of the multitude, the Jews putting him forward. And Alexander beckoned with the hand, and would have made his defence unto the people. Acts 19:34 But when they recognized that he was a Jew, a single outcry arose from them all as they shouted for about two hours, "Great is Artemis of the Ephesians!" KJV Acts 19:34 But when they knew that he was a Jew, all with one voice about the space of two hours cried out, Great is Diana of the Ephesians. Acts 19:35 After quieting the crowd, the town clerk said^, "Men of Ephesus, what man is there after all who does not know that the city of the Ephesians is guardian of the temple of the great Artemis and of the image which fell down from heaven? KJV Acts 19:35 And when the townclerk had appeased the people, he said, Ye men of Ephesus, what man is there that knoweth not how that the city of the Ephesians is a worshipper of the great goddess Diana, and of the image which fell down from Jupiter? Acts 19:36 "So, since these are undeniable facts, you ought to keep calm and to do nothing rash. KJV Acts 19:36 Seeing then that these things cannot be spoken against, ye ought to be quiet, and to do nothing rashly. Acts 19:37 "For you have brought these men here who are neither robbers of temples nor blasphemers of our goddess. KJV Acts 19:37 For ye have brought hither these men, which are neither robbers of churches, nor yet blasphemers of your goddess. Acts 19:38 "So then, if Demetrius and the craftsmen who are with him have a complaint against any man, the courts are in session and proconsuls are available; let them bring charges against one another. KJV Acts 19:38 Wherefore if Demetrius, and the craftsmen which are with him, have a matter against any man, the law is open, and there are deputies: let them implead one another. the law is open or, the court-days are kept. Acts 19:39 "But if you want anything beyond this, it shall be settled in the lawful assembly. KJV Acts 19:39 But if ye enquire any thing concerning other matters, it shall be determined in a lawful assembly. Acts 19:40 "For indeed we are in danger of being accused of a riot in connection with today's events, since there is no real cause for it, and in this connection we will be unable to account for this disorderly gathering." KJV Acts 19:40 For we are in danger to be called in question for this day's uproar, there being no cause whereby we may give an account of this concourse. Acts 19:41 41 After saying this he dismissed the assembly. KJV Acts 19:41 And when he had thus spoken, he dismissed the assembly.